Flat Feet can be a significant impediment to running since that activity utilizes the feet in an intense manner. This condition causes the arch of the foot to collapse and acquire a flattened appearance. This can cause a number of issues including discomfort in the heel and ankles and also a tendency of over-pronation. Pronation is the movement of the foot in an inwards direction to absorb the forces incurred after each step. When this process occurs abnormally, it leads to a less than ideal amount of absorption of shock. If flat feet cause over-pronation in runners, they will be prone to injuries such as tendonitis. Utilizing custom orthotics such as braces or insoles, that are custom made to fit the exact contours of the runner’s foot, will provide immense support. Choosing the right pair of running shoes is imperative to alleviating over-pronation. Use shoes that provide stability and motion control since they have firm midsoles. These shoes incorporate outer soles that bend at the toe location but not in the center where the arch is located. This helps to provide much-needed support for the arch during running. The back of running shoes should be rigid so that they provide sufficient support for the heel. Shoes should have wide toe box areas to accommodate flat feet. There is not one size that fits all, and the proper custom fit should be obtained to provide support during running. Flat feet can be a pain for normal activities, yet it can be even more of a burden when running. Please contact us to determine the extent of intrusion that your flat feet are having on your running capabilities. 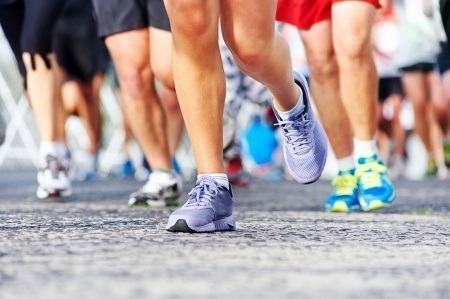 At Performance Foot & Ankle Specialists, LLC, located in Waterbury 203-755-0489 & Newtown 203-270-6724, Connecticut, our podiatrist, Dr. Joel S. Segalman, DPM recognizes how important sporting activities are to his patients. He will provide your flat feet with the latest treatment techniques to help give you the best chance of beating your run-time record! Call our office at any of the two numbers listed above for treatment now.